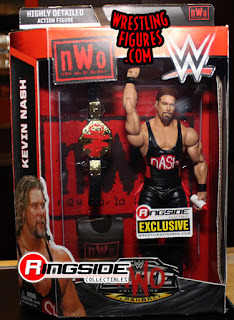 Ok, so I normally reserve this every year for Toyfair, but today after viewing WrestlingFigs.com coverage of the yearly WWE endorsed signing/convention in NYC, Ringside Fest, I had to do an entry about my favorites. Sure, Toyfair and even SDCC give us plenty of figures to drool over, but that's the first 6 months of the year. This is the last 4 months, so there's still time to put out new products. And since Mattel is usually involved in this show, we get a good fistful of prototypes that we can expect in late 2015 or early 2016. Ok, let's just put it out there. The body type isn't exactly the most accurate considering Kevin is on the doughy side. But that's ok, because his facial likeness is pretty spot on which makes up for the mismatched body. Kevin is currently my favorite on the entire WWE roster, and has been a favorite of mine since seeing him on the indie circuit as Kevin Steen, so I will definitely pick this one up! From 1989-1991, Randy Savage went through a phase where he called himself the Macho King. He decided that if he can't be world champion, he'd be King of the WWF. This is actually one of my favorite eras of Randy Savage's career, as I think he got some real fun matches out of it and his character was even more over the top. RingsideCollectibles offered an exclusive Macho King years ago, and I missed out, so this is a perfect opportunity to pick one up. And check out those wild tights! Definitely a perfect sculpt and paint job. 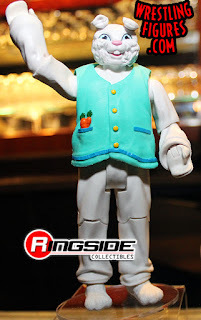 Plenty of great Macho Man figures have come by, but this may be the coolest yet. Currently out nursing an injury, NXT standout Sami Zayn has become a fan favorite super quick since being signed to NXT. Sami's already had a figure in the basic line, but this figure seems to be a part of the "Elite" line, which usually has more accessories and a more interesting paint jobs. This is a pretty spot on likeness and even includes his NXT title, which is a big draw as well. Looks to be one of the best NXT figures to date! Bobby Heenan is the greatest manager ever to enter pro wrestling. FACT. If you were managed by Bobby, then you were in a top spot by proxy. This set features three of his best charges. Andre The Giant, Mr. Perfect and Big John Studd as well as the Weasel himself. These may be the best interpretations of each wrestler we've seen. Judging by the spectacular 4 Horsemen set sold exclusively at Target, I have to assume this will also be an exclusive. If that's true, this will be a hot seller and will be the must own for every fan. YES YES YES YES!!!!! Adam Rose was given a gimmick where he'd come out to the ring with a lot of goofball party maniacs called "The Rosebuds" and it includes a wrestler dressed in a full rabbit costume. He'd come out, do frog splashes and even started to feud with Adam. It was never revealed who it was, but screw it. I see a giant wrestling rabbit. And being a father of two adopted rabbits, anything rabbit related I must have. So it all works out. Oh snap, I just noticed he has carrots in his pocket. Stop it. Release this now. NOW. NOW NOW. 2016 is going to be a great year for wrestling figures. There were some other great figures being released, but these are by far my favorites. What are your favorites? You can find the entire reveal here, at WrestlingFigs.com.